I will start off this adventure with a key document showing three generations of the family in question. This document gives me some approximate birth dates and birth locations as a starting point for further investigation. I just love the New York State Census series. Over the years these state census records have answered lots of questions and solved a few mysteries for me. I only wish more states had participated in similar census. You can click on the above image for an enlarged version of the document. Laton Kanistanaux, age 48 (b.c1832), male, Indian, born in Oneida Co., now married, occupation “Physician“, “native” voting status, owns the land. Marleh Kanistanaux, age 48 (b.c1832), female, Indian, wife, born in Canada, now married. Carrie Kanistanaux, age 18 (b.c1857), female, Indian, daughter, born in Canada, now single. Henry J. Kanistanaux, age 16 (b.c1859), Indian, son, born in Canada. Willie Kanistanaux, age 2 (b.c1873), male, Indian, son, born in Canada. Eli Moulton, 91, male, no race or color, (st-Father? ), born in Connecticut, now widowed, occupation “hunter”, “native” voting status. I have a reasonably good copy of the document and the census taker has decent handwriting. Most of the information is clear. However, the relationship of Eli Moulton to the head of the household is not clear. No matter how hard I squint or how I hold my mouth, I can’t quite make out what it says. 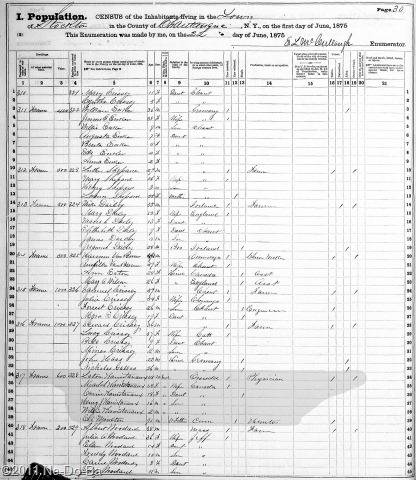 Perhaps if I had the census pages from the whole town to look at I could compare the census taker’s handwriting in other entries and perhaps determine what it says. If this was really important, this would be a good method to try. But in this case, I am not prepared to go to that extent. My best guess is “st-Father”, perhaps for “step-father”. My preliminary research suggests it should say “Father-in-law”. I want to remind my readers that census records are wonderful, but we should never accept the data as completely reliable. The census taker goes out in the field and takes down the information provided to him by whomever he can find to answer his questions. In most cases it is a member of the household who provides the information, but not always. The person providing the answers may not always know the correct answer. They may guess or they may intentionally provide inaccurate information. The census taker is not required to ask for proof or to collaborate the information with official records. After collecting the data the census taker generally transfers the data from his field notes to a more formal form. With luck, he does a good job and is careful. However, he is human and he will make errors! I will continue to look for additional historical documents to help me determine the accuracy of this census information, just in case the census taker was having a bad day when he visited this family. I also have to be careful of how I interpret old documents. One must always be aware of terminology with more than one meaning or a meaning that changes over time. One of the columns to the far right has to do with voting privilege. The two options are “native” and “naturalized”. The use of the term “native” refers to having voting privilege by birth, i.e. being native to the U.S. as apposed to being born outside of the U.S. and acquiring voting privilege by legal process. I hear from people that have a transcript of a document such as this and they are convinced this type of statement is documented proof they are Native American. Sorry, it is just not so. Everyone in the household is clearly identified as “Indian” with the exception of Eli Moulton. The head of the household and his wife are middle-aged with two older teenagers – and a two year old! It seems more likely the 2 year old would be a grandson. I think I need to look into that a bit more. I asked the researcher I hired through GenealogyFreelancer.com to check for other people in town with the surnames Kanistanaux and Moulton and for other “Indian” people while she was retrieving this document for me. She found none. This appears to be an isolated Native family. In this time period, many of the Native families found “off-reservation” are seasonal wanderers that frequently return to their traditional communities. The census tells me Layton owns the land he lives on. This ownership of the land suggests the family has actually left the Native community they once belonged to. I have two clues as to where their Native community might be located. Layton was born in Oneida Co., NY, so I need to search for possible Native communities in that county. The others were born in Canada. Unfortunately, that is a very large place and there are thousands of Native communities located there. I think I need to narrow that down a bit before I begin that search. I noticed a couple of interesting things about Eli. He was born in Connecticut and he is styled as a “hunter”. Not an occupation you see often in the northeast except among Native men. But wait, Eli is the only one in the family that is not Native! This suggests Eli may have been living among Native Peoples for a reasonably long period of time. Long enough to adopt their manners and customs. And at age 91, I would say it was a life that treated him pretty good if he is still able to pursue any occupation! The head of the household is Layton Kanistanaux, a physician. Now, I must keep in mind that the year is 1875 and just about anyone could hang out a shingle and claim to be a doctor. My own prior research on this very topic shows this to be a wonderful time period for “Indian Doctors” to ply their trade in herbal medicine. They probably knew as much if not more about how to heal what ails you than the college educated men. For readers that want to learn more about “Indian Doctors” I suggest reading “The Story of John W. Johnson” found on the Ne-Do-Ba website. The site also has information on other “Indian Doctors”. Start on this page and explore from there. You will also want to check out the Belmont Newell pages. As you will see from looking through the suggested reading, there was a great deal of salesmanship and showmanship that often went along with this occupation. See the Kanistanaux Home Page for more. Do you have any information to add or questions?